I design and build online & on-site digital media for learning, utilizing immersive visuals, music, storytelling, and interactivity to illuminate worlds of ideas. 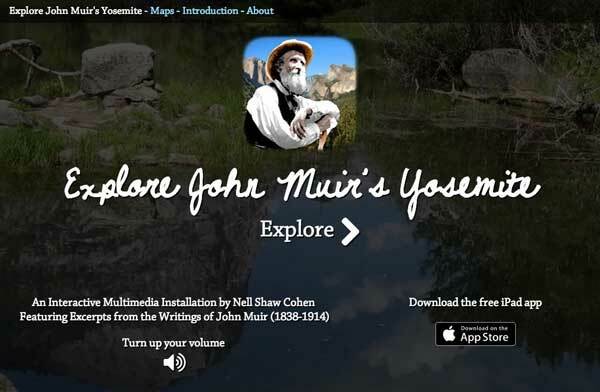 Explore John Muir's Yosemite is a web installation & iPad app illustrating the writings of John Muir through interactive photography and music. 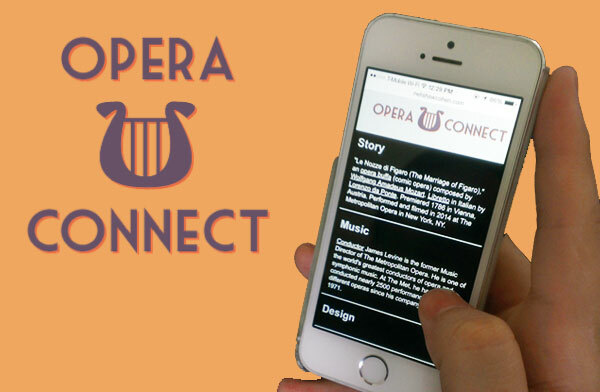 Opera Connect is a design for social, technology-guided opera viewing experiences that create points of entry into opera for underserved audiences. 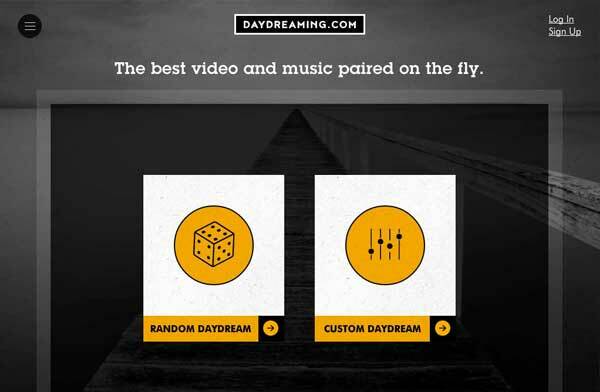 Daydreaming.com is a website & mobile app that generates customized pairings of video and music to fuel creativity, inspiration, and joy. 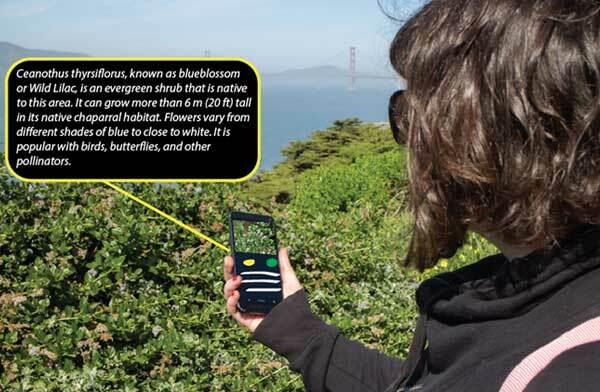 Field Guide: Golden Gate is a design for a mobile app that facilitates outdoor learning in the Golden Gate National Recreation Area. 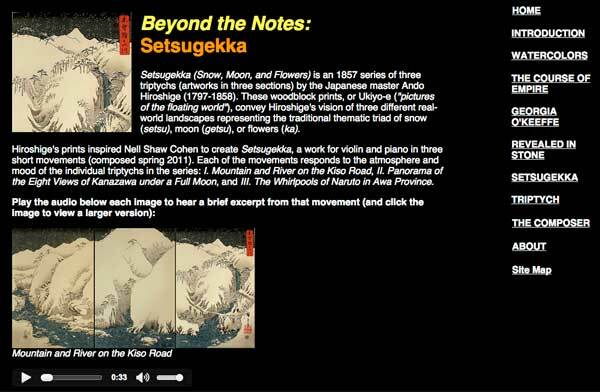 Beyond the Notes: Music Inspired by Art is a program of chamber music and a guide for web & mobile illuminating art, music, and the connections between them. 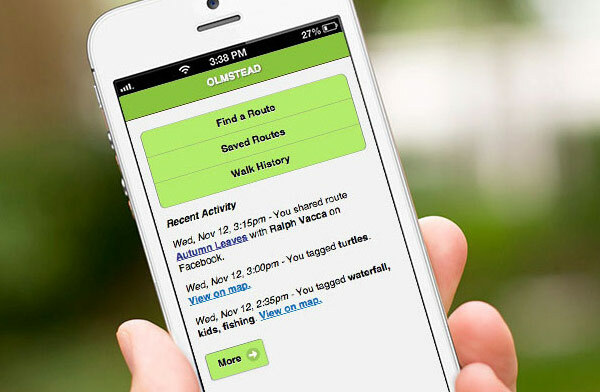 OLMSTEAD is a design for a mobile app aiding navigation through Brooklyn's Prospect Park. 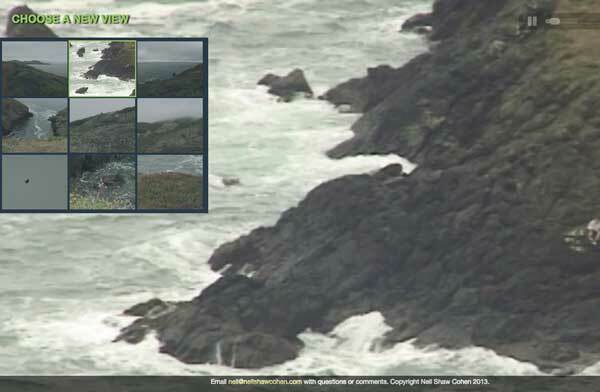 "John Heiss on Charles Ives" and "The Marin Headlands in Fog" are experiments in non-linear, interactive video for the web. With skills in Experience Design, Web & Mobile Design, Media Production, and Music Composition, I apply a combination of specialized technical knowledge, detail-oriented execution, and holistic, creative thinking to all of my work. In many of my projects, I've handled everything from project management to videography to code. I've seen projects through from an inkling of an idea to a public-ready, functional implementation, whether it was a one-day experiment or a year-long production. I've also recently been developing concepts for increasingly complex software systems and user experiences. I'm eager to collaborate on the iteration and implementation of these projects. Because I have experience with diverse disciplines and practices ranging from visual design to environmental education, I'm well-prepared to communicate meaningfully with, and work alongside, experts and specialists in other fields. Examples of both types—fully-implemented solo projects and design concepts—are included in this website. 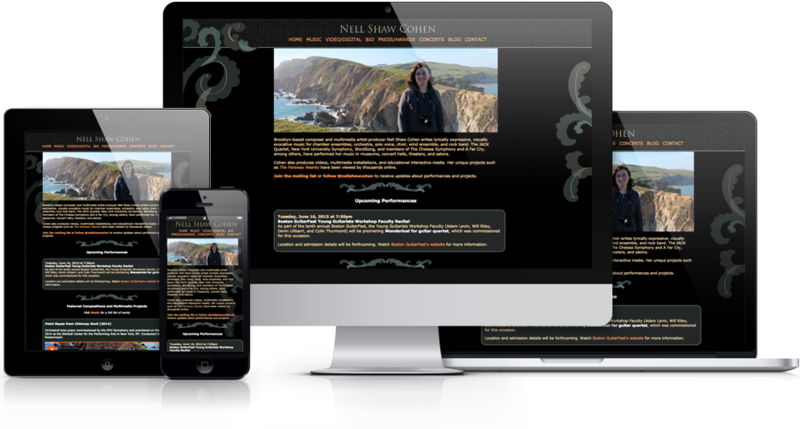 "I've worked with Nell throughout the stages of website concepting, design and development. She's extraordinary in all ways: extremely smart, imaginative, diverse in her way of looking at things, friendly, thoughtful, and thorough. I came to her with the shell of an idea and she went about ideating and iterating in a process that was impressive and thoroughly enjoyable." 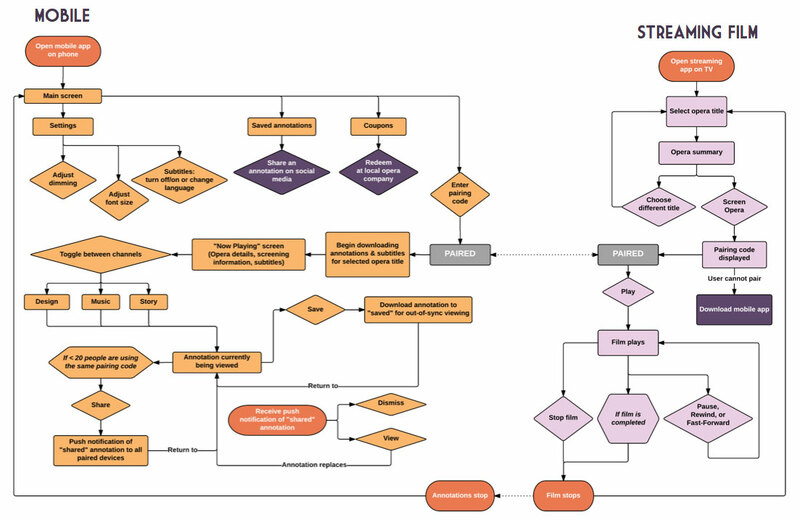 Sample logic flow from Opera Connect. Design concepts encompassing web, mobile, second screen, public interactives, and tangible computing. Application of sound learning design principles drawn from learning theory and cognitive science. Prototypes spanning from lo-fi paper prototypes up to functional web apps (everything but the back-end). Experience with research-based design process, built on a foundation of target user research, expert interviews, landscape audits, and literature reviews. Advanced Certificate in Digital Media Design for Learning from New York University. Completed graduate courses in Learning Theory, Cognitive Science, Interaction Design, UX Research, UX Design, and Instructional Design, with a 4.0 GPA. Responsive design across platforms. Example shown: nellshawcohen.com. Websites designed and coded from the ground-up, utilizing modern HTML5 and CSS3 responsive design practices. Familiarity with basic front-end development, enabling collaboration and communication with dedicated web developers. Designed, produced, and co-developed multimedia installation Explore John Muir’s Yosemite for web and iPad, in collaboration with developer John Resig. Listed in Apple App Store. Extensive experience as entrepreneurial teenaged web designer. Clients included musicians from Blue Man Group and rock band The Flaming Lips; Airavata Foundation, a tsunami aid fund; San Francisco’s Dance Mission Theater; Young Performers Theater. Awarded First Prize, the Network for Teaching Entrepreneurship Bay Area Student Business Plan Competition. 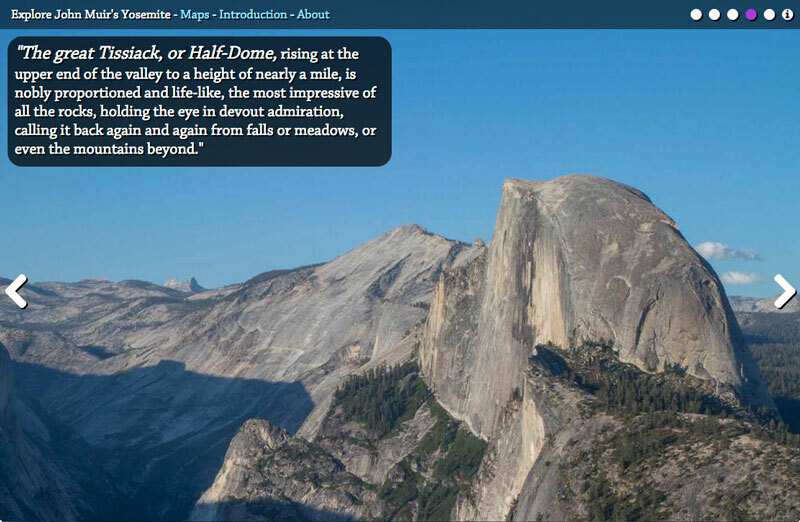 Web & iPad app "Explore John Muir's Yosemite." One-woman production studio for multimedia content. Experience with multiple audio & visual media as producer, creator, writer, and editor. 60+ videos produced on on multidisciplinary arts & culture topics, ranging from Modern Dance to art history, with ~65,000 YouTube views. Created 30+ art and music education videos for Music Inspired by Art mobile web app & website, including interviews with senior curators at major museums. 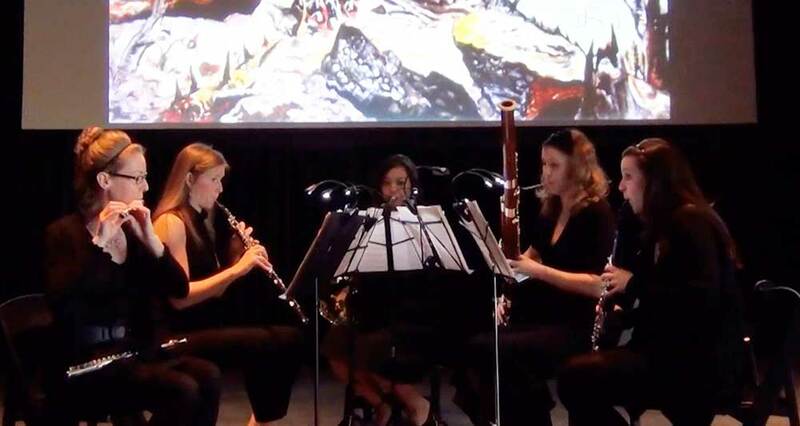 The Chelsea Quintet performs "Watercolors" with video projection at the grand opening of the Parrish Art Museum, 2012. Over 30 compositions for chamber ensembles, orchestra, wind ensemble, choir, solo voice, and rock band, which have collectively received ~60 performances and recordings. Experience with a range of styles in classical, rock, and jazz. Produced numerous concerts, including staged workshop production of one-act opera monodrama (with costumes, sets, lighting), an evening-length recital featuring several chamber ensembles, and multimedia concerts combining visual art with video and music at the Peabody Essex Museum and the grand opening of the Parrish Art Museum. Commissions include NYU Symphony, Boston GuitarFest, WordSong, and the San Francisco State University Flute Choir. Scoring for picture work includes interactive media projects, non-narrative art videos, as well as documentary and promotional videos for Angioplasty.org; University of Massachusetts Boston; New England Conservatory; et al. Composed, produced, and performed all vocals and instruments on full-length prog rock album released under stage name Nell James. Positive reviews include former Village Voice music editor Chuck Eddy in Harp Magazine. Numerous awards and honors, including NYU Symphony Composer-in-Residence (2014) and Ellen Taaffe Zwilich Prize from the International Alliance for Women in Music (2009). Bachelor of Music with Honors from New England Conservatory (GPA 3.99), Master of Music from New York University (GPA 4.0). Finale, Logic Pro, GarageBand, Soundbooth, lots and lots of emails! 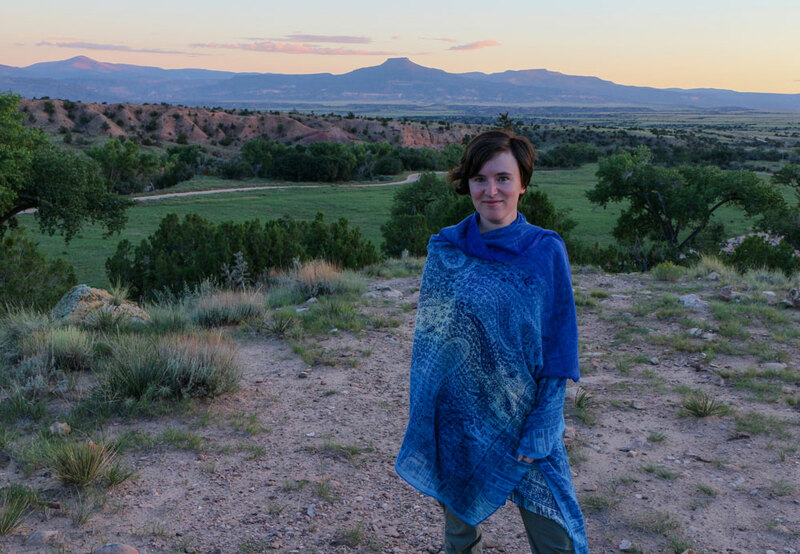 Nell at Ghost Ranch in Abiquiu, New Mexico, 2016. Hi, I'm Nell Shaw Cohen. I'm a composer, multimedia artist, experience designer, and educational media producer based in Brooklyn, NY. As a former unschooler and lifelong learner, my passion for learning drives my work. I want to create educational experiences that are enjoyable, meaningful, useful, and memorable, and which leverage the aesthetic and emotional impact of music and visuals—and the affordances of web and digital technologies—to the fullest. My multidisciplinary music and media projects have led me to film in the badlands of New Mexico and the mountains of Yosemite; to interview prominent curators and scholars on subjects ranging from synesthesia to Charles Ives; and to attract grant support from New York University Steinhardt's Challenge Grants and New England Conservatory's Entrepreneurial Musicianship Department. Having earned an Advanced Certificate (2015, GPA 4.0) from NYU's Digital Media Design for Learning program, I'm armed with a foundation of knowledge in learning theory, user experience design, interaction design, instructional design, and media for museums and public spaces. My work in educational media is also rooted in my love of the arts. I'm a classically-trained composer with a Master of Music ('14) in Music Composition from NYU and a Bachelor of Music with Honors ('12) from New England Conservatory. I've written for chamber ensembles, orchestra, opera, voice, choir, wind ensemble, and rock band. My music has been performed in museums, concert halls, theaters, and salons. Visit nellshawcohen.com to learn more about my music and multimedia art. You can find me on email, Twitter, and LinkedIn. Download my resume. References are available upon request. Copyright © 2017 Nell Shaw Cohen.